Hello! 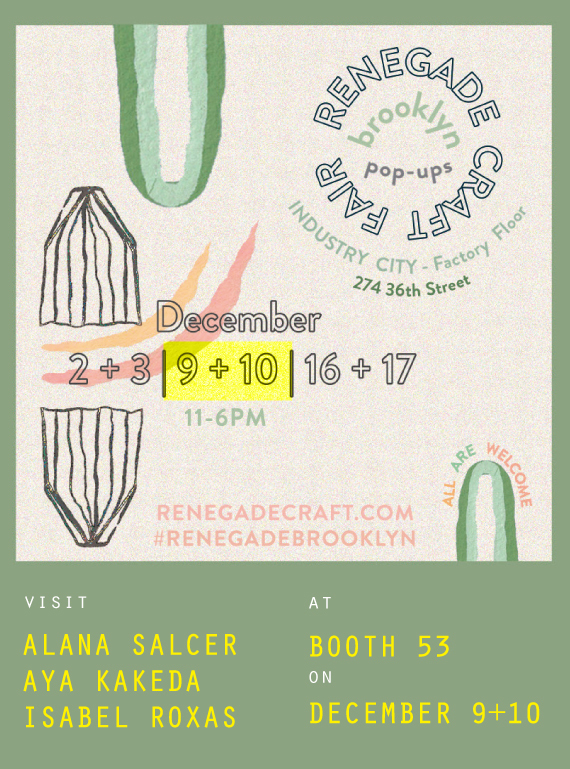 I will be at Renegade Craft Fair with my ceramic works this weekend. If you are in Brooklyn, please stop by! Also if you are not in NY area I just opened the web store, too. Getting cold out, stay warm and have a nice winter day! Tomenosuke owner Shinji sent me these photos at Japanese Shrine. Love all the color matching! And here is a big news! If you get the first Three microbus editions (neon pink, electric blue, and Glow in the dark) you can win my original painting which is featured on the header cards!!! 3Days till the New Years! Hope you will have a great New Year's eve and Happy 2015!!! Hello!! !Tomorrow is the opening for Microchan Attack Exhibition in Montpellier, France! Come come if you are in the area. We produced special edition prints for this event. Edition of 45. MOCCA Art Festival FUN! Thank You! Thank you for coming by my table last weekend, it was great to see many familiar faces and also meeting some amazing new people/artists. This was my first MOCCA, I have been doing other festivals past years but I truly think MOCCA is very special! I think Society of Illustrators did a great job putting together, thank you SI and volunteer team!I didn't have much time walking around to take some photos but here are some that I have and some of my studiomates photos! Charlie Brown!!! Mascot of MOCCA, he will be part of the Macy's easter parade this year. I was happy that our studio's booth was right below!!! (Photo by Diana Di Nazzo) Here is my booth! Our studio had 4 tables this year. Close ups of my booth. Lots of small books and sculptures this year not to forget Zombi cat Cookies!!! Here are our whole 4 table run down :-) (All the photos are by Joel Alter) Everyone had super successful MOCCA!!! Thank YOUUUUUU for the great experience! It was a happy weekend for me. p.s. Here is a photo from our studio after party. We have done it! YEY! Here is some sneak preview! Double thank you for Kimiko and Fumiha for helping me bake!!!!! Mighty Wallet Store at the Union Sq. Holiday Market this month! I went few days ago to stop by and say hello. If you live in NY please stop by! I got a nicer close up photos from the Mighty Wallet! Oh I love how it came out!!! It's out on the JapanLA web store---> here Woohoo! Collaborating with Dynomighty Mighty Wallet! This was such a fun collaboration with Dynomighty. we came up with two designs, one is from my silkscreen series from long time ago ( blue tree image inside is a pink tree) also from a recent painting series (girl with flower dress inside is a flower pattern.) I'm really interested in finding out which sells better the recent or past creation? here is their press release about these wallets! there are info about where to get also. looking for a cool Christmas presents? Go DYNOMIGHTY!!!! Dynomighty, makers of Mighty Wallet the original Tyvek® wallet, have partnered with the amazingly radiant kawaii store JapanLA in Los Angeles for an exclusive artist series and pop-up shop. Working with world renowned brands tokidoki, TKDK, and top tier artists 64 Colors, Aya Kakeda, TADO, Luke Chueh, and Camilla d'Errico, they created a limited edition series of wallets that showcase the characteristics surrounding JapanLA. Officially opening November 29th, the pop-up shop within JapanLA is a unique chance for the west coast to get a first hand look at some amazing art, and pick up an exclusive wallet, just in time for the holidays! If you can't make it to JapanLA between November 29th, and December 31st you can go to JapanLAclothing.com, the Dynomighty Holiday Shop in Union Square NYC, or Dynomighty.com starting December 6th to pick out your favorite. This exclusive artist series is for a limited time, and will be sold exclusively through JapanLA and Dynomighty throughout the month of December! Don't wait, stop by JapanLA or visit us in Union Square to get yours!